Barcelona have reportedly placed a €100m valuation on Philippe Coutinho as they could be open to selling him this summer. The 26-year-old dazzled at Liverpool last season, emerging as one of the top creative stars in Europe which in turn led to his move to the Nou Camp last January. However, in his first full season with the Catalan giants, he has managed just nine goals and five assists in 41 appearances, with much more undoubtedly expected from him prior to the campaign getting underway. That in turn has led to ongoing speculation over his future, with Calciomercato now reporting that Barcelona have put a €100m price-tag on Coutinho with Manchester United specifically named as an interested party. Time will tell if the Brazilian international does move on this summer, as it could be argued that he should at least stay on for a second full campaign to prove his worth to the reigning La Liga champions having now had plenty of time to settle and adjust. 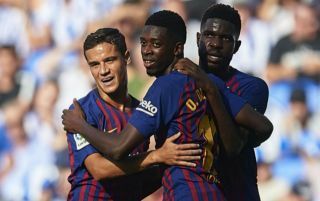 Nevertheless, such is the level of expectation at Barcelona as they continue to compete on multiple fronts, coach Ernesto Valverde will surely need more and could be in favour of a reshuffle in the final third depending on who could come in. Coutinho still has time to play a major role for Barca, as they still have the league title, Copa del Rey and Champions League to play for between now and the end of the season. However, time will tell if Man Utd, or any other interested party for that matter, is willing to splash out €100m on him and test the resolve of Barcelona this summer if they are indeed willing to listen to offers.